SendTelegram.com’s internet telegram service (Service) allows you to send a telegram anywhere in the world using your credit card or debit card. By using or attempting to use the Service, you agree to be bound by the following terms and conditions. Please read them carefully. The Service allows you to compose a written message and designate the name and physical address of its intended recipient, all on the SendTelegram.com website. The Service agrees to deliver your message to the recipient on paper in a sealed envelope. You agree to pay a transaction fee for each use of the Service. You agree to write the recipient’s address using the Latin (also called Roman) alphabet. The Service will not be able to deliver your telegram if the address is written in any other alphabet. The Service will attempt to provide look-up and/or address correction service as requested or as necessary to effect delivery. The Service cannot guarantee the accuracy of any look-up or address correction provided. The Service does not save, on its computer system or otherwise, any telegram or the address of any recipient. We guarantee that your telegram to a business address in the USA will be delivered the same day if you enter and pay for it by noon (destination time). 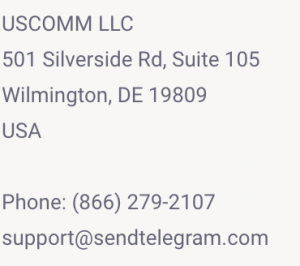 We guarantee that your telegram to a residential address in the USA will be delivered the next day if you enter and pay for it by noon (destination time). If we are not able to deliver your US telegram by these times (whichever is applicable), we will refund the price you paid. Delivery times to non-USA destinations provided on this website are our best estimates but are not guaranteed. Telegrams to recipients at hotels, churches, chapels, funeral homes, and other businesses are delivered to the reception desk. The Service cannot guarantee that such telegrams will then be delivered by the business’s staff to the designated individual recipient. Telegrams to non-USA addresses are called cablegrams. Cablegrams are routed to the destination country’s local telegraph office and are usually delivered within 24 hours of being ordered. Cablegrams include telegrams to ships at sea, where the ship’s communications office is analogous to a destination country’s local telegraph office. Cablegrams are accepted at the SENDER’S RISK. The Service delivers telegrams to the destination country’s local telegraph office. Then, it is the responsibility of the destination country’s local telegraph office to handle the delivery in a timely fashion in accordance with its own regulations and procedures. Such delivery by the destination country’s local telegraph office may include postal delivery. Sometimes a copy of a telegram is posted in addition to regular delivery. There is no additional charge for such a copy. The Service does not receive confirmation of delivery to the recipient from the destination country. Instead, the Service receives only an electronic confirmation that the telegram was received by the destination’s telegraph office. Cut-off time for same-day delivery is noon, for next-day delivery – 5 p.m. on previous business day (time at destination). There is no delivery to residential addresses on Sunday. same day until 17.00, wed & fri until 11.00. Rural areas by postal, usually the next working day. The current delivery information by country is posted on the Resources section within this website. Neither the Military Postal Service nor any other component of the Department of Defense (DoD) has approved, endorsed, or authorized the Service. SendTelegram.com does not guarantee the accuracy of DoD-related information contained on the SendTelegram.com website, nor does SendTelegram.com guarantee the accuracy of any publicly available DoD documents that are linked to or referenced on this site. Any commercial use of the Service, including but not limited to use of the Service for business or home solicitation, or for the resale of the Services, is expressly prohibited. You agree to abide by all applicable local, state, national, and international laws and regulations and are solely responsible for all acts or omissions that occur under your account or password, including the content of your transmissions through the Service. By way of example, and not as a limitation, you agree not to use the Service in connection with chain letters or any other duplicative unsolicited messages (commercial or otherwise); harvest or otherwise collect information about others without their consent; create a false identity or forged messages, or otherwise attempt to mislead others as to the identity of the sender or the origin of the message; transmit through the Service unlawful, harassing, libelous, abusive, threatening, harmful, vulgar, obscene, or otherwise objectionable material of any kind or nature; transmit any material that may infringe the intellectual property rights or other rights of third parties, including trademark, copyright, or publicity rights; libel or slander any person; infringe upon any person’s privacy rights; or engage in any other activity that SendTelegram.com believes could subject it to criminal liability or civil penalty or judgment. SendTelegram.com may, in its sole discretion, block delivery of any telegram that violates the policy set forth in this Section. Except as may be prohibited by law, you will be notified within a reasonable time at the email address you provide us if the message is not delivered pursuant to this Section. YOU WILL NOT RECEIVE A REFUND OF THE TRANSACTION FEE. SendTelegram.com frequently updates, modifies, and otherwise seeks to improve the Service. Such changes often dictate that we simultaneously modify our terms of service. SendTelegram.com shall have the right to modify the terms and conditions for use of the Service and to change or discontinue any aspect or feature of SendTelegram.com, in either case as it deems reasonably necessary. Such changes shall be effective immediately upon posting of such addition, change, or deletion. Any use by you of the Service after any such change has been posted shall constitute your acceptance of any such changes. YOU EXPRESSLY ACKNOWLEDGE AND AGREE THAT USE OF THE SERVICE AND THE INTERNET GENERALLY IS AT YOUR OWN RISK AND THAT THE SERVICE IS PROVIDED “AS IS” AND “AS AVAILABLE” WITHOUT ANY WARRANTIES WHATSOEVER, EXPRESS OR IMPLIED. SENDTELEGRAM.COM WILL USE COMMERCIALLY REASONABLE EFFORTS TO MAKE ACCESS TO THE SERVICE AVAILABLE TO YOU THROUGH THE REQUIRED ACCESS PROTOCOLS, BUT MAKES NO WARRANTY OR GUARANTEE THAT YOU WILL BE ABLE TO ACCESS THE SERVICE AT ANY PARTICULAR TIME OR ANY PARTICULAR LOCATION. (iii) SHALL IN NO EVENT BE LIABLE TO YOU OR ANYONE ELSE FOR ANY CONSEQUENTIAL, INCIDENTAL, OR SPECIAL DAMAGES ARISING OUT OF, RESULTING FROM, OR RELATING IN ANY MANNER TO THE SERVICE OR THE USE THEREOF OR INABILITY TO USE THE SERVICE GENERALLY, AND ANY CONTENT OR SERVICES CONTAINED THEREIN. WITHOUT IN ANY WAY LIMITING THE FOREGOING, SENDTELEGRAM.COM AND ITS AFFILIATES, AGENTS, CONTENT PROVIDERS, SERVICE PROVIDERS, AND LICENSORS SHALL IN NO EVENT HAVE ANY LIABILITY WHATSOEVER IN EXCESS OF AN AMOUNT EQUAL TO THE TRANSACTION FEE CHARGED FOR THE TELEGRAM GIVING RISE TO THE DISPUTE OR ALLEGED LIABILITY. SENDTELEGRAM.COM AND ITS AFFILIATES, AGENTS, CONTENT PROVIDERS, SERVICE PROVIDERS AND LICENSORS SPECIFICALLY DISCLAIM ANY EXPRESS OR IMPLIED WARRANTY OF FITNESS FOR HIGH-RISK ACTIVITIES, INCLUDING BUT NOT LIMITED TO EMERGENCY NOTIFICATIONS OF ANY TYPE AND NOTIFICATIONS PURSUANT TO A COMMERCIAL RELATIONSHIP. SOME JURISDICTIONS DO NOT ALLOW THE EXCLUSION OR LIMITATION OF WARRANTIES OR INCIDENTAL OR CONSEQUENTIAL DAMAGES, SO THE ABOVE LIMITATIONS OR EXCLUSIONS MAY NOT APPLY TO YOU. IN SUCH JURISDICTIONS, SENDTELEGRAM.COM’S LIABILITY (AND THE LIABILITY OF ITS AFFILIATES, AGENTS, CONTENT PROVIDERS AND SERVICE PROVIDERS) SHALL BE LIMITED TO THE GREATEST EXTENT PERMITTED BY APPLICABLE LAW. Notwithstanding anything to the contrary contained herein, the provisions in this “No Warranties or Liabilities” section are for the benefit of SendTelegram.com and its affiliates, agents, content providers, and service providers and each shall have the right to assert and enforce such provisions directly on its own behalf. You agree to indemnify, hold harmless, and defend SendTelegram.com, and its affiliates, agents, content providers, and service providers, against any and all claims, liabilities, damages, costs and expenses (including, but not limited to, consequential damages, incidental damages, special damages, attorneys’ fees, and disbursements) arising from or relating to your use of the Service in any manner and your use of the Service in violation of any law, rule, or regulation. You agree to cooperate as fully as reasonably required in the defense of any claim. SendTelegram.com reserves the right, at its own expense, to assume the exclusive defense and control of any matter otherwise subject to indemnification by you. The failure of either party to exercise in any respect any right provided for herein will not be deemed a waiver of any other right hereunder, or of the same right in the future. If any provision of these terms and conditions is found to be unenforceable or invalid, that provision will be limited or eliminated to the minimum extent necessary so that these terms and conditions will otherwise remain in full force and effect. You agree to accept all disclosures (including, without limitation, disclosures required under federal or state laws relating to privacy or electronic fund transfers) and other communications between you and us on this website or at the email address you provided to us. You may print and retain a copy of all such disclosures and communications by using your personal computer and printer. In the event that the email address you gave us when ordering a telegram changes before a telegram has been delivered and/or we have received your payment, you must notify us of your new email address.